Rather than offering disconnected tips, they focus on the fundamental principles for transforming complicated topics into clear prose, and demonstrate how to apply these principles at all levels of a document, from its overall organization down to its paragraphs and sentences. As a result, the programs help lawyers to think like a writer with the same intellectual sophistication with which they already think like lawyers. In addition to tackling a writing program’s usual topics, these programs focus on the problem that most often plagues even the best legal writers: organizing sections, passages and longer paragraphs that deal with complex analyses. The programs share an approach and materials with programs taught by Professor Timothy Terrell of Emory University School of Law and John Salatti of LAWriters. This program is relevant to all lawyers who write expository or persuasive documents. (It does not deal with contract drafting.) Its two modules can be conducted separately or as a single program; other formats are also possible. Because of the program’s approach, it can be particularly effective for an audience of senior as well as junior lawyers, as a means of building a common approach to editing complex documents. The program can be conducted in several formats: as a full-day, in combination with elements of the first program; as a half-day, standing on its own; or as a shorter program that covers only one or two of the topics listed above. The programs described above often have the greatest effect if the participants also receive individualized coaching on their writing. Steve Armstrong or another instructor provides this coaching by reading and commenting on writing samples in advance, and then meeting with each lawyer for 45 to 60 minutes. These tutorials can be conducted for approximately eight associates during a day. This three-hour program is designed for lawyers who edit the work of others. It first provides a framework for diagnosing and addressing the major problems that get in the way of a document’s clarity, and then goes on to help supervising lawyers use their edits to teach effectively. The program can also be conducted for an audience that includes both senior and junior lawyers to create a common framework for “thinking like an editor,” whether the participants usually edit their own drafts or those of another lawyer’s. 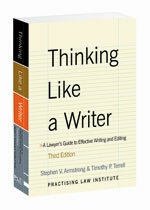 Steve's legal writing programs help lawyers to “think like a writer” – and like an editor – with the same intellectual sophistication with which they think like lawyers.